Venture Beat reports this morning about a solar thermal company gaining "significant traction: Solel, a manufacturer and installer of solar thermal energy generators, has taken in US$105 million from London-based investment firm Ecofin. "In the space of the past couple years, the 20 year old Israeli company has taken flight, accumulating contracts and equipment orders and signing agreements to build major generation projects in California and Spain. "In California and Nevada, Ausra and Brightsource are also competing for attention, scaling up operations as rapidly as possible. At least for the moment, solar thermal looks like a safer bet than photovoltaics, based on the economics. "However, that story may be changing, as solar PV manufacturers bring down costs over the next few years." Google's Larry, Sergei, and Curly, er, Larry B on climate change in conversation with Thomas Friedman. Amazing that the poverty and climate change agendas are coming together; something we've written about at length on The Green Skeptic. Connect these conversations with Gates's "Creative Capitalism" and Muhammad Yunus's call for social business and perhaps we can get a new triple bottom line: new energy jobs, poverty elimination, and lessen the impacts of global warming. You've got to applaud the hubris of the Google guys -- and hubris is what it's going to take to push progress. Push on! 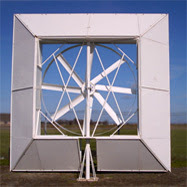 "The company’s 'ducted' wind turbine looks a bit like a 19 foot tall box fan. Despite its clunky appearance, it’s capable of re-orienting itself according to the direction of air flow, while the ducting is intended to increase wind speed as it approaches the blades. "At the moment, two models are sold — one intended for areas with wind speeds of 6-10 mph, and another for higher average speeds. The turbines are intended for buildings between one and three stories tall. "Marquiss received the $1.3 million funding from Velocity Venture Capital, which led, and Strategis Early Ventures. The funding was the Folsom, Calif. company’s first." With all due respect to Messrs Bush, Paulson, and...well, Bernanke too, I suppose, this economic stimulus seems more like a styptic pencil. You know, those things used to temporarily stop bleeding from shaving cuts and the like? If BPB really wanted to stop the bleeding, US leaders would accelerate investments into creating a new, clean economy. I'm not alone in this thinking. The National Hydropower Association, Geothermal Energy Association, Solar Energy Industries Association (SEIA), and American Wind Energy Association issued a joint statement earlier this week calling for an extension of long-term renewable energy tax credits as part of the US economic stimulus package. The current stimulus package does not extend the renewable energy incentives, which expire at the end of this year. And that is too bad. Letting these incentives expire will potentially eliminate thousands of jobs and derail billions of dollars in future investments, according to sources close to the situation. All this when we're experiencing record private investment in alternative energy. "2007 was a record year for renewable energy in the U.S. Almost 6,000 megawatts of new renewable energy came on line in 2007, infusing over $20 billion of investment into our economy," Rhone Resch, president of SEIA, told a packed house at the National Press Club the other day. "And along with this investment came jobs. In 2007, the renewable energy industries put Americans back to work, creating tens of thousands of high quality jobs in all 50 states. Jobs like electricians and plumbers, line workers, roofers, engineers, and high-paying manufacturing jobs. These jobs are the backbone of our economy in the U.S.
"But already these jobs and many more are at risk. The 2007 energy bill was passed in December with much fanfare, but without an extension of the renewable energy tax credits. Already we are seeing sales and new project announcements drop off. Large scale solar and wind projects take longer than a year to site, permit and construct. And with only 11 months to go before the credits expire, these projects have started drying up. Even larger concentrating solar, geothermal and hydro projects take many years to construct and will not get built without a long-term extension of the tax credits. If the renewable energy tax credits are allowed to expire, we will lose hundreds of thousands of jobs here in the US." "As leaders of four major renewable energy trade associations, we respectfully urge bipartisan Congressional Leadership and the President to work together to include renewable energy tax provisions in any economic stimulus legislation currently being developed," said Resch. "Renewable energy will put Americans back to work, provide reliable and domestic energy for homes and businesses, and spur billions of dollars of economic investment but only if Congress and the Administration take immediate action to extend the renewable energy tax credits." I agree with Mr. Resch and his colleagues: If you're serious about stimulating the economy, Messrs BPB, perhaps it's time to seriously invest in a new, clean economy. Break Through: From Ashes of Environmentalism Comes Hope and Imagination? Environmentalists have it all wrong. We don't need no stinking limits, what we need is economic growth fueled by a massive investment in alternative energy that positively transforms the living standards of people around the world. We need a new, new economy that is not based on what we can't do or shouldn't do, but on what we can do. We need energy independence and ecological security. We need an agenda that puts investment, jobs, and economic growth front and center. The spirit of possibility is at hand, we need only take it up -- and secure a front-loaded investment in R&D from the Department of Defense to get this thing moving. Okay, I'll get off my soap box. Readers of The Green Skeptic are familiar enough with my thoughts on the matter. Much of this kind of thinking runs through the pages of Ted Nordhaus and Michael Shellenberger's new book Break Through: From the Death of Environmentalism to the Politics of Possibility, which I've just finished. You remember them? They got many pairs of green knickers in a twist with their essay calling for abandoning the environmental movement (and a few cheers from some of the more skeptical among us). They've written an important book. Flawed, but important. And a little bipolar. One the one hand, it's a much-needed critique of the way the environmental movement thinks and speaks of its issues. This follows logically on their original essay. And it is sort of in the vein of William Easterly and John Perkins' confessionals/attacks on their former selves. I mean, these guys were strategists for some of the doom and gloomers; now they've seen the light and the error of their ways. In terms of making change, their basic argument is that people rate the environment and global warming low on their list of concerns, relative to other concerns like economic security, terrorism, etc. And the enviros haven't been listening; they want to convince. For example, Americans are more concerned by rising energy prices than the prospects of global warming. Yet the prevailing environmental messaging strategy calls for raising energy prices even higher through taxes and such. Certainly a disconnect there. Ya think? But when it comes to providing hope beyond some flowery rhetoric, Nordhaus and Shellenberger offer very little new thinking. A little pimping for their Apollo-style energy proposal, which was introduced into Congress by Representative Jay Inslee of Washington, and the authors are off on quite a few tangents about NIMBYism and facing the fact that we are now like Gods and we'd better get used to it. The second half of the book could have used some heavy editing and shaping by the gang at Houghton-Mifflin. You can get by with a snarky attitude if you really have something to say, believe me. In the end, however, you have to bring your whole game. I wanted a little more pragmatism in the chapter of that name. And what was the point of that attack on Francis Fukuyama in the final chapter? At times, such as in the clever analysis of how Tony Blair lost the war on global warming on the world stage, it seemed like a clever magazine article run amok. That said, the authors rightly point out that to succeed in turning this around, we need remember what we're great at: "imagining, experimenting, and inventing the future." We can imagine a better future if we set our minds to it. So what are we waiting for? Global Water Challenge (GWC) and Ashoka's Changemakers have partnered to launch Tapping Local Innovation: Unclogging the Water and Sanitation Crisis, an online collaborative competition to discover and support entrepreneurs large and small who offer groundbreaking approaches to the most pressing water and sanitation challenges. The Coca-Cola Company is contributing a lead grant of US$1 million to support the collaborative effort to find and fund truly innovative solutions that address the water crisis. This commitment and partnership were announced at the World Economic Forum at Davos today. The Forum has fostering Collaborative Innovation as one of its stated goals. Most people do not think about water; they turn on a tap and clean water flows readily. But for more than 1.1 billion people around the world, access to safe water is a constant concern. Suitable sanitation facilities are in even shorter supply. A lack of basic bathroom facilities deprives 2.6 billion people of human privacy and dignity. "We have both the resources and the will to live in a world in which everyone can drink clean water and use a safe toilet," said Paul Faeth, Executive Director of GWC. "This open source competition is unique in allowing social entrepreneurs working in the farthest corners of the world to connect with a dynamic community of experts and funders that can improve and expand the impact these entrepreneurs can have." "Global Water Challenge seeks to make existing projects even stronger and connect local innovators with global investors who can bring solutions to scale. By partnering with Ashoka's Changemakers, Global Water Challenge has a platform to challenge the world's entrepreneurs to use their substantial talents to solve the world's water and sanitation crisis," says Charlie Brown, the executive director of Ashoka's Changemakers. Brown notes that the Changemakers Web site encourages collaboration and discussion to draw out and strengthen the most effective ideas. Innovators can post their applications on the Ashoka's Changemakers Web site at www.changemakers.net now through March 26, 2008. During this time, applications will be available to anyone for review, comment and discussion. Once the entry period has closed, a panel of judges, including Ian Callaghan, Director of the Microfinance Group at Morgan Stanley, and Dr. Sanjay Gupta, Chief Medical Correspondent on CNN, will select finalists and the global online community will vote for the winners. The winners will receive funds in recognition of their work. Global Water Challenge (GWC) is a coalition of leading organizations, which have joined forces to catalyze transformational change in the water and sanitation sector. We believe that we have both the resources and the will to live in a world in which everyone can drink clean water, and use a safe toilet. Our mission is to generate a global movement to meet the urgent need for safe water and sanitation by spurring collective awareness and investment in innovation by corporate, public and nongovernmental actors. GWC focuses on collaborative learning, connecting leaders, and investing in sustainable, replicable, and scalable projects. Ashoka's Changemakers is building the world's first global online "open source" community that competes to surface the best social solutions to the world's most pressing issues. We focus on thematic, collaborative competitions, inviting innovators from around the world to profile and collaborate with a global community of investors, thought leaders and enthusiasts. To date Changemakers has launched 14 successful collaborative competitions and attracted more than 2,000 high-impact solutions from more than 125 countries. Changemakers builds on Ashoka's 26 year history identifying and selecting leading social entrepreneurs and its belief in "everyone a changemaker" global society. Get involved by visiting Changemakers online (you must register to participate). I realized today that I've been giving a lot of space to solar on this blog -- okay, I confess, my obsession with First Solar has been getting out of hand, especially in the first month of 2008! But as long as it holds above my initial position, I'll try to ignore those additional shares I bought before the tumble. Then it came to my attention (thanks to Triple Pundit) that the American Wind Energy Association (AWEA) last week reported record growth in wind power generation with 5,244 megawatts of capacity installed in 2007 – a 45 percent increase reflecting US$9 billion in investment and 30 percent of all new power generating capacity in 2007. But not so fast. The same report notes that 2008 "will likely show growing pains as there is a current shortage of wind turbines, a situation that the AWEA sees as a big opportunity for manufacturers and entrepreneurs wishing to get in on a growing market. There’s always a better mouse trap – wind energy technology is ripe for imaginative innovators to not only fill the current need for parts, but to continually make those parts better." TP adds: "It is also time for government to step up to the plate and push forward in support of alternative energy in a big way. Congress is debating this week the future of alternative energy tax credits set to expire this year with no current provision for renewal. "While the Energy Independence and Security Act of 2007 recently signed in Congress does provide $2 billion dollars in research for alternative energy, it still pales in comparison to subsidies given the fossil fuel industry. "Farmers also have a great opportunity to capitalize on wind power generation, 'growing' energy from wind and leaving their corn for food instead of ethanol. After all, not all alternative energy is created equal." Silicon Alley Insider reports today that Bug Labs is now open for business, taking orders for its new open-source modular unit on its Web store, albeit without the WiFi unit. Bug Labs was the darling of CES and featured on The Big Idea with Donny Deutsch, where founder Peter Semmelhack got to meet with bloggers on the bus and pitch their product. It's a cool product, known as the "Bug," a build-your-own mobile gadget platform. "The Bug," according to Silicon Alley Insider, "is basically a Lego kit for mobile coders: Mix-and-match up to four modules like LCD screens, GPS, a digital camera, etc., and write whatever software you want. A base unit costs $299; an all-in starter kit with motion sensor, GPS, LCD touchscreen, and 2-megapixel digital camera costs $549. "The company is initially targeting hobbyists and prototypers -- both tiny markets. But Bug Labs also hopes some industries might figure out how to use the Bug as a basis for commercial devices -- and help provide backers Union Square Ventures and Spark Capital a return on their investment." I've been interested in the Bug since last fall when I first learned about it from Brad Burnham at USV. As he described it to me I envisioned all sorts of cool uses for it in the field -- for conservation, microfinance, and global climate change monitoring. Want to map sacred sites and conservation lands in Outer Mongolia? Snap on the GPS unit, take pictures and positioning, and upload data about what's found on the site. Doing due diligence on a small MFI? Use the Bug's wireless function to tap into your records back in the office. Think sea level is rising on your remote Pacific island and need to track changes over time for adaptation models? I bet you can do that with Bug. The only thing missing is a remote sensing module that can gauge temperature changes, barometric pressure, soil types and temps, and other indicators. But that may come with demand or a really good hacker. Anyway, I'm excited about the possibilities here. If and when the price comes down, this gadget could have all sorts of applications in the field. I'll be meeting with founder Peter Semmelhack in a couple of weeks and will try to explore this line of thinking further. Venture Beat reports that "Cleantech funding almost doubled [in Q4'07] over the previous year, reaching $468.7 million in the quarter — apparently a record quarter. Major deals included EverPower Renewables, which raised $55 million for wind-power farms and Serious Materials, which drew $50 million for green building materials." And the Cleantech Group LLC reports that 2007 venture investment in alternative energy markets in North America and Europe was $5.18 billion, compared with $3.6 billion the previous year: Cleantech. ...knee surgery. Torn medial meniscus. Wish me luck and I'll be back on my feet again before First Solar climbs back above 200. I don't know which hurts more, my knee or the solar slump! I'm convinced the knee is proof there's no such thing as "Intelligent Design." Really. The led says it all: "The booming solar power sector is about to get squeezed by the age-old laws of supply and demand." This comes from a very smart article from Nichola Groom at Reuters News Service, which I'm going to quote in its entirety, just because those of us interested in the solar market need to pay attention. I will note, however, that despite Ms. Brown's assertion that First Solar (and other thin-film manufacturers) are well-positioned, they closed at 181 today. That hurts. Solar energy companies are scrambling to ramp up production amid skyrocketing interest in renewable energy, but the pendulum is swinging quickly toward oversupply. That places a few players in the sector, including Yingli Green Energy Holding Co Ltd, First Solar Inc, as well as Q-Cells and SolarWorld AG, in the best position to benefit from the changing dynamics, analysts said. Torrid investment in 2007 fueled growth at solar companies JA Solar Holdings Co Ltd, Suntech Power Holdings Co Ltd, SunPower Corp and others thanks to global warming concerns, soaring fossil fuel prices and government subsidies in Germany, Spain and the United States. The shares of those companies soared last year, but have been pummeled in the opening weeks of 2008 as concerns about a possible US recession weigh down the broader market. Still, strong demand for solar panels is expected to continue through this year, although more of the industry's key raw ingredient, polysilicon, is coming to the market, which will lead to more photovoltaic (PV) cells that convert sunlight into electricity. Cells are then packaged together to form the modules that make up solar panels. By next year, supply could very well outstrip demand. "Companies are working really hard over the next year-and- a-half to put the steel in the ground and develop on the expansions that they've promised," said Karina Funk, an analyst with Winslow Green Mutual Funds in Boston, which manages about US$580 million. "The dynamic is definitely going to change once that supply is in the market." The supply demand shift has investors wondering which solar companies are best prepared to preserve their lofty profit margins by reducing costs as prices fall. Last week, Banc of America Securities analyst Eric Brown advised clients to be selective about photovoltaic manufacturers over the next year, citing expectations that oncoming capacity would drive down selling prices. "In spite of strong growth ahead, we are neutral on the PV sector," Brown wrote. "Lower barriers to entry will contribute to lower prices -- and consequently lower margins." The emergence of dozens of Chinese solar companies and the greater availability of polysilicon, which has been in short supply, are helping drive supply increases, Brown said. He expects module prices to fall 15 percent in 2009, leading to weaker profit margins across the industry. He said Yingli Green Energy and First Solar were well positioned because of their low cost structures. First Solar, which makes thin-film cells, also benefits because its cells do not rely on polysilicon, he added. German bank WestLB said Monday that growing supplies of silicon should lead to lower margins for cell, wafer and module producers in 2009. Large, vertically integrated companies such as Q-Cells and SolarWorld were most likely to withstand this development. ThinkEquity Partners solar industry analyst Jonathan Hoopes said, however, that because so many of the solar module makers are start-ups that are still ramping up production, they have significant opportunities to cut costs in the near term. "We think there are a lot of costs to come out of this model as they scale up," Hoopes said. "This market is relatively nascent." One way solar companies have already reduced costs is through deals with companies further up or down the supply stream, Funk said, citing cell manufacturer SunPower's 2006 acquisition of panel installation company PowerLight Corp. Earlier this month, solar wafer maker LDK Solar Co Ltd made a similar move, taking a 33.5 percent stake in crucible maker Jiangxi Sinoma New Material Co Ltd. Crucibles are used to heat silicon to very high temperatures. One big unknown is demand. Although the industry is expected to keep expanding at a rapid clip, that growth still depends on the outlook for government incentives and subsidies. Lehman Brothers analyst Vishal Shah said government incentive programs in Germany and Spain, which have been key to driving growth, would help support prices. 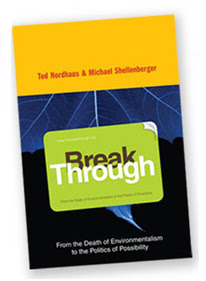 I'm reading Break Through: From the Death of Environmentalism to the Politics of Possibility by Ted Nordhaus and Michael Shellenberger. You'll remember them as the two who caused such controversy in the environmental community a few years ago. "Is it really so hard to imagine a world with healthy forests, a stable climate, and seven to ten billion people living in sustainable cities? How might history have turned out differently had we imagined the solution to global warming as unleashing rather than restricting human activity? What if we had conceptualized global warming not as the result of too much economic develoment but rather as the result of too little clean economic development?" A week ago I confessed to some trepidation about all the buzz going on about solar energy. I feared a bubble -- or worse, a blister. I scanned and scoured the analysis and research on First Solar FSLR, a company I have been tracking for some time and in which I own some stock. First Call, Channel Trend, Ford, investment sites, top stock bloggers, you name it. I went back to their quarterly conference call and listened again. I reviewed all my notes and thoughts and analysis. I was doing my homework. Times and markets like these require lots of homework. In the end, I concluded that the solar market is not a bubble, that demand will be growing, and that First Solar was in a prime position because it is a market leader in thin film panels, it has already achieved an impressive conversion rate for efficiency, management has a good long-term growth plan, and it is close to securing a long-term supply of one of its chief components. So on Friday, I increased my position and bought additional shares. So far, so good. Only, I bought those additional shares at 250 and it has been sliding down ever since, hitting its nadir yesterday at 210 before hiking back up to a respectable 234 -- but still way lower than the 52-week high. Luckily, it's balanced out in my protfolio by earlier gains. Just goes to show you, all the due diligence in the world cannot predict what the market will do. Disclosure: I'm still long on First Solar. I also own a position in China Sunergy, which has been getting burned by solar blister, too. Next up was Andrea Black, a former College Summit student and now Teach for America teacher (both groups are award winners...). She was absolutely inspiring and her story demonstrates the importance of not counting anyone out before they have even had a chance. The list of awardees was also impressive, including some that we have featured on The Green Skeptic (DonorsChoose, Acumen Fund, Root Capital). ...and for the first year, a group of for-profit companies was selected...including Herman Miller, SustainAbility, and Domini Social Investments. The clean energy sector powered ahead in 2007, according to analysts New Energy Finance. In spite of difficult conditions on the credit markets, the amount of new money invested in the sector grew to $117.2 billion, up 41% from 2006's $83.0 billion*, and more than $20 billion ahead of predictions. The clean energy sector weathered last summer's credit crunch well, partly because nonfinancial drivers such as regulation, political will and fears over energy supplies remain strong. It was also helped by a shift in focus from more mature wind and biofuels markets in Western Europe and the US towards Asia, Brazil and other developing countries. Wind power continued to lead the way, but the year also saw strong growth in solar power and energy efficiency. Investments in biofuels fell back from 2006's record year, hampered by surging feedstock costs. *The biggest portion of investment funds went to asset financing, up 40% on 2006, at $54.5 billion. *The highest growth rate was in public markets, where investment was 80% higher than in 2006, at $18.9 billion, the biggest portion being the $6.6 billion flotation of Iberdrola Renovables (Iberenova). If this IPO is excluded, public market new investment grew by a more sedate 17%. *Venture capital and private equity new investment grew by 27% to $8.5 billion. Investors retreated from later stage investments and returned to early stage deals, as their familiarity with the sector and technologies grew and the pipeline of commercialisationready opportunities dried up. *The year was marked by the launch of clean energy funds by several high street asset management companies, including HSBC, F&C, Schroeders, Virgin and DWS. Michael Liebreich, Chairman and CEO of New Energy Finance commented: "At the start of 2007 we said that the clean energy industry had to deliver clean, cost-effective power and fuels in large volume in order to justify investors' enthusiasm. That remains just as true today: investors' enthusiasm still outstrips the industry's current contribution to solving the world's environmental and energy security problems. However, progress is being made on scaling up a number of sectors, particularly wind, solar, biomass and energy efficiency. The wave of liquidity washing through the sector shows no signs of abating and, despite the dark clouds still massed over the world's credit markets, 2008 looks set to be another banner year." Clean energy asset financing was resilient in 2007 in the face of turmoil on the world's debt markets, with a record $54.5 billion invested. Investors were forced to shift their emphasis from project finance deals to on-balance-sheet financings, which made up 64% of total asset financing activity, up from 44% in 2006. Much of this came from the South American biofuels industry and wind, biomass and waste-to-energy deals in China. Wind investment accounted for nearly half of the total new investment in projects, or $24.8 billion. Much of the growth in wind investment in 2007 took place in Asia and Oceania, whose $8.4 billion of deals outstripped the Americas ($6.6 billion) while investment in the EMEA region grew to $9.8 billion after falling by $1.5 billion in 2006. The remaining $29.7 billion investment was largely in biofuels projects ($14.5 billion); biomass & waste ($7.1 billion); and solar ($5.9 billion). The 30% increase in investment in biofuel assets contrasted with 2006's 171% growth, which was driven by the US's love affair with corn-based ethanol. In 2007, much of the activity took place in South America, chiefly in Brazil, while the US ethanol industry stalled under difficult market conditions, with many producers shelving plans for capacity expansion. The ratification in December of the US energy bill, with its ambitious renewable fuels standard that calls for 36 billion gallons of alternative fuels by 2022, should considerably improve the outlook for US ethanol. New investment in biomass & waste grew by 51% from $4.7 billion in 2006. As with wind, most of the surge took place in China, where the government has great hopes for biomass. Solar project investment of $5.9 billion was 82% higher than 2006, as Spain and Italy continued their drive for larger photovoltaic projects. Spain has seen a great rush as investors tried to push their projects to qualify for the a 400MW subsidy cap. Greece and France are largely markets-in-waiting, constrained by bureaucracy and the lack of mature building-integrated photovoltaic products. In 2007, $18.9 billion of new money was raised by clean energy companies on the public markets, up 80% from $10.5 billion last year. Much of the increase was driven by one deal: the landmark flotation of Iberdrola Renovables, which raised $6.6 billion, six times more than the previous record deal, REC of Norway's $1.1 billion IPO last May. Although the IPO was priced at the bottom end of its lead coordinators' price range at €5.30 per share, it represented a hefty market capitalisation of €22.4 billion ($33 billion) at the start of trading on 13 December. Solar companies raised $5.8 billion of new equity on the public markets during 2007, once again chiefly Chinese cell and module makers listing on US markets. Biofuels groups managed to raise $1.0 billion, almost $2 billion less than in 2006, and energy efficiency groups caused excitement,by raising $0.8 billion, led by EnerNOC and Comverge, as policy makers and investors realised the potential of the sector. In 2007, venture capital and private equity investment increased to $8.5 billion, up 27% from 2006. Early-stage VC made strong gains, increasing to $1.8 billion from $0.8 billion in 2006 as investors found it harder to find value in later stage deals due to greater competition and were driven to make earlier-stage bets. Late stage VC was the only investment stage to attract less money than last year, falling by a little over $100m to $1.1 billion. Solar became the leading sector for VC and PE, attracting $3.0 billion of new equity, and biofuels decreased slightly on last year to $2.0 billion. The two other leading sectors were wind ($1.8 billion) and energy efficiency companies ($1.2 billion). Much of the increase in solar investment was down to young US solar companies attracting early-stage VC investment. In 2006, just $181m was invested in such firms, in 2007 this increased to $702m. In Europe, where the solar industry is more mature, a meagre $59m of early-stage VC found its way to solar companies. Some of bigger solar investments worldwide were in thin-film technology, which offers a way around the currently limited supply of solar silicon. HelioVolt raised $101m, while Solyndra raised $80m and SoloPower attracted $30m. Solar installation companies also featured prominently, pushed into the spotlight by Arnold Schwarzenegger's California Solar Initiative. Early stage venture investment in energy efficiency companies more than doubled in both North America and Europe, to $316m and $96m respectively. * Note: The previously reported figures of $71 billion to $75 billion for 2006 excluded certain categories of investment such as solar water heating, which are now included – hence the restated 2006 figure of $83.0 billion. I've spent the better part of this evening reviewing my position on First Solar, in light of all the buzz around solar stocks. 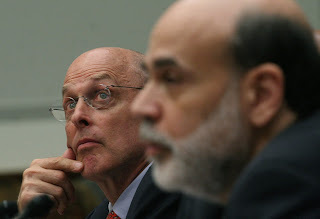 Are we heading for another bubble -- call it a blister in the sun, to pay homage to the Violent Femmes' classic. Should it trouble me that even formerly overlooked companies are getting a boost? The overwhelming consensus is not yet. VentureBeat reported today that BCC Research has released a report with detailed predictions for some specific sectors of the solar market, calling for a three-fold growth in the solar industry in the next four years. According to the report, Photovoltaics: Global Markets & Technologies (EGY014F) from BCC Research, the global market for photovoltaics (PV) is expected to be worth $12.9 billion in 2007. This is expected to increase to over $32.3 billion by 2012, a compound average annual growth rate (CAGR) of 14.9%. Global shipments of PV cells/modules reached 2,875.1 megawatts (MW) in 2007. They are projected to grow by 28.6% to reach 3,697.3 MW by 2007, and by a CAGR of 30% to reach 13,724.4 MW by 2013. "Thin film cell manufacturers such as Nanosolar and Heliovolt," VentureBeat reports, "will grow some 45 percent each year. Use of multicrystalline silicon in standard photovoltaics, meanwhile, will grow at 285 percent annually, rapidly taking over the market share of more efficient, but also much more expensive, single-crystal silicon." Some don't feel that way and are predicting a shakedown in solar companies, with perhaps some consolidation and restructuring. Even First Solar, the darling among solar stocks, which has increased dramatically (over 880 percent) since its IPO, has come under fire. Some are short-selling, saying it's over-valued, others are saying it will implode because of the limited supply and associated increased costs of Tellurium, which is critical to its thin film production. For now, I'm staying long with FSLR. Why? First Solar is the leader in Cadmium Telluride (CdTe) thin film technology and has already achieved an impressive 9 percent conversion efficiency with its modules. In addition, its management on the December conference call stated they are "trying to achieve 90 percent confidence" in obtaining a 5-year supply to ramp up their proposed new facilities, which strikes me as sound planning rather than panic. Finally, as one commenter ("Pouting Thomas") on the Tellurium Supernova post remarked back in early December, First Solar is basically a glass panel manufacturer -- indeed one of the best -- so even if there are significant advances in printed, flexible PV films, they'll still need to be sandwiched between inexpensive glass for strength and protection. In this, too, First Solar appears to have a good opportunity to adapt. That said, I will keep a close eye on FSLR for the next 6 months. Let's hope this isn't a blister in the sun and we can go wild for a while LONGer. The promoters behind the upcoming Greener Gadgets Conference kicked off a design competition last week seeking innovations in greener electronics. Design firms, up-and-coming designers and students are encouraged to explore gadgets that address energy, carbon footprint, health and toxicity, lifecycle, social development and new materials. The main thrust of the contest is the minimization of the environmental impact of consumer electronics in areas such as materials, labor, assembly, packaging, transportation, retailing, use and disposal, among others. Entrants will be judged on innovation, clarity of design, originality, form and presentation by representatives of Greener Gadgets and partner Core77, an industrial design website. Inhabitat and Marc Alt + Partners will present the Greener Gadgets Conference being held Feb. 1 in New York City. The deadline to enter the contest is Jan. 27. One grand prize entry, earning $2,500 in cash, and two runner-ups, each earning $1,000, will be showcased at the conference. To enter the design competition, visit http://www.core77.com/competitions/greener_gadgets.asp. Scientific American has a feature piece by Ken Zweibel, James Mason, and Vasilis Fthenakis on a potential future for solar energy in the United States. *A massive switch from coal, oil, natural gas and nuclear power plants to solar power plants could supply 69 percent of the U.S. electricity and 35 percent of its total energy by 2050. *A vast area of photovoltaic cells would have to be erected in the Southwest. Excess daytime energy would be stored as compressed air in underground caverns to be tapped during nighttime hours. *Large solar concentrator power plants would be built as well. *A new DC (direct-current) power transmission backbone would deliver solar electricity across the country. *Unfortunately, this may require US$420 billion in subsidies from 2011 to 2050 to fund the infrastructure and make it cost-competitive.